Slice three mushrooms into thin slices–1-1.5 cups–and cook in a small pat of butter over med-low heat, stirring occasionally. After the mushrooms have been cooking for a couple of minutes, add salt and pepper (helps to pull the water out of them and prevent too much browning). Cook until tender, about 5 minutes. While mushrooms are cooking, beat 1 egg and 2 egg whites (this is what I did, but you can use your own combo of eggs, yolks, and whites. Knock yerself out) with milk (1 T for every egg), and salt and pepper. I cooked the omlette in the same pan as I’d cooked the mushrooms in. So, next I removed the mushrooms from the pan and let them rest on a paper towel, folded in half. I thought this would help soak up some of their moisture and prevent the omlette from getting runny/slimy when they went back in. I hate slimy/runny eggs. So, with the mushrooms resting comfortably, I put the pan back on med-low and added another small pat of butter. Once the butter was melted and the bottom of the pan coated with it, I poured in the eggs. Now comes the waiting time. Wait, wait, wait for the eggs to cook. In the past, I’ve been all impatient with my omlettes, and cooked them at too high a heat because I was in a hurry for them to be done. Today, I sucked it up, and waited. Eventually, the eggs bubbled up a little in the middle, and, taking that as a sign of…well, something happening…I started nudging the sides of the eggs away from the pan, tilting it so that the still runny parts washed into the opening. 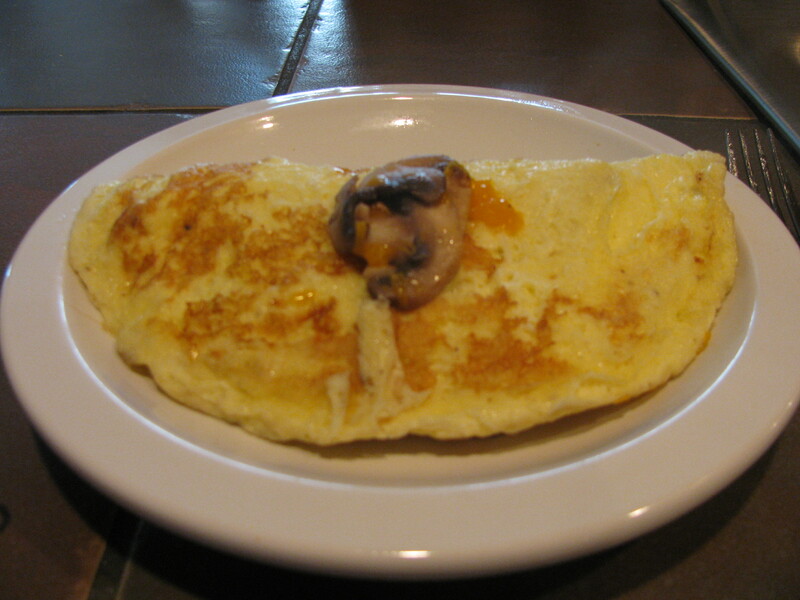 I continued to nudge and slide the omlette until there wasn’t any more runny egg on top. Then I waited some more. Maybe another 30 seconds. Then I gave the pan a tentative shake and amazingly, the omlette came loose and slid around on the pan in one sheet. Yay! I gently worked my spatula underneath and with one smooth motion, flipped it over (splattering myself and the cooktop with egg. Yeah. Not so smooth, really). I let it cook another 30 seconds, and then topped one side with the mushrooms and about 3 T of shredded cheddar cheese. Again, I worked the spatula under–this time under the non-topped side of the omlette and carefully folded it over the cheese and mushrooms. Normally, this is another dicey moment in omlette making for me, because the eggs break or the filling all falls out or something disastrous like that. But today, perfection. I waited a moment so that the cheese would be totally melted and then slid the whole thing onto a plate, took a picture, topped off my coffee and dug in. T, who’d had cereal, looked at it and said, “Maybe I should have had an omlette. That looks good.” T doesn’t like eggs any way but fried, so far as I know. Something to do with an unfortunate scrambled egg regurgitation event in his childhood. I think he blames his younger sister for this. At any rate, given his fried-only egg status, I took this to be high praise. And, internet, I’m here to tell you, it tasted as good as it looked. And maybe I’m being irrational and delusional when I say this, but I totally think it was the farm fresh eggs and fresh, local mushrooms that made the difference. Have you ever compared? Can anyone back me up on this?